Who says dietitians don’t eat pizza?! I consider myself to be a predominantly plant-based eater. That means that I strive to make most of my diet come from plants, with enough wiggle room to enjoy foods that I love (hi, cheese!). I choose to eat this way because the evidence supporting a plant-based diet for preventing chronic disease and increased longevity is overwhelming. Study after study shows that plant-based eaters have a significantly reduced risk of cancer, type-2 diabetes, and heart disease. However, I know it can be hard to give up animal products completely. 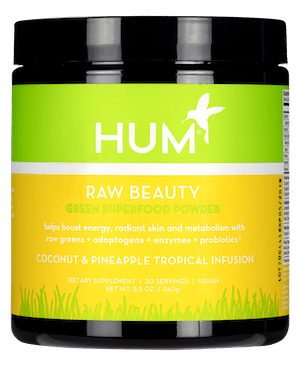 It’s why you’ll see that my diet includes a lot of plants, but with a few goodies mixed in. I try to work out first thing each morning. Sometimes that looks like an hour-long conditioning class, and sometimes that’s a few sun salutations or a walk around the block. Since my workouts are usually less than 60 minutes, I don’t eat anything beforehand. However, I always try to drink at least 16 ounces of water during and after. As a new mom, my diet is all over the place. I rarely sit down for meals except for dinner. Also, I often find myself snacking in the car or with my infant in one hand. It’s not ideal, but it’s real. 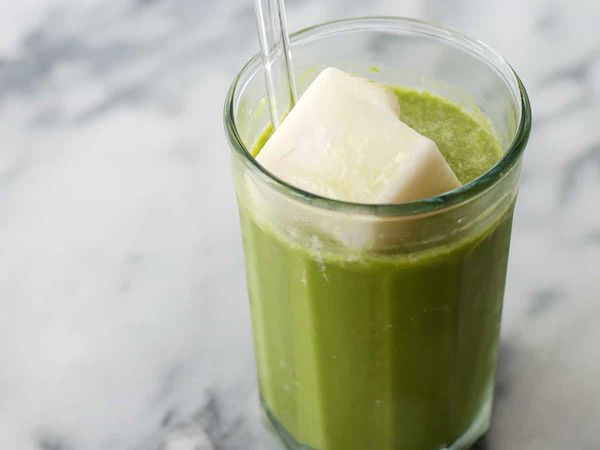 Today I had a matcha latte with coconut milk (and coconut milk ice cubes—so creamy!) and a peach. By the time I got home from the gym and fed my son, I had 15 minutes to quickly get dressed and leave the house. I drank my latte and ate my peach in the car on the way. 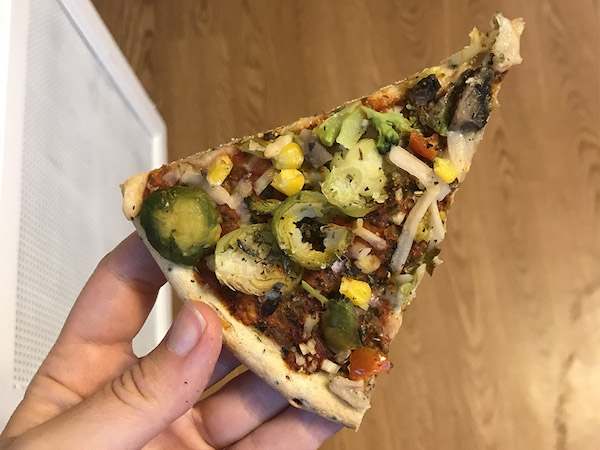 We had pizza and a salad for dinner last night, so I had a slice of this vegan pizza when I got home around 11 a.m. While I’m okay with real pizza every now and then, I love this version with a chia crust, dairy-free cheese sauce, and lots of vegetables. My lunches are mixed. Sometimes I bring leftovers, sometimes I go out, and sometimes I pack ready-to-eat meals. Since this morning was hectic, I didn’t have time to put together anything else. 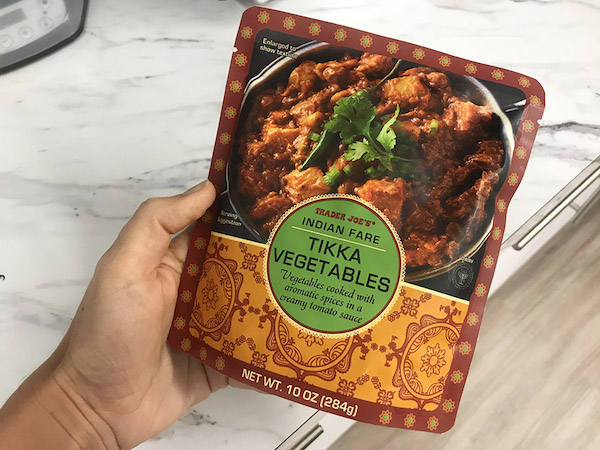 Thankfully, I stocked up on a few of these Indian packets from Trader Joe’s (see also my Trader Joe’s must-haves). I love that they’re vegetarian and contain lots of vegetables, and they’re easy to heat at the office. After heading home mid-afternoon for a few hours to play with my son, feed him dinner and give him a bath, I headed back to the office to finish some projects. 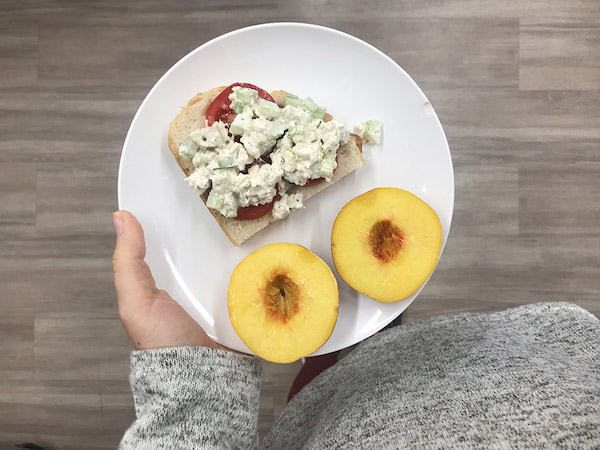 Therefore, my dinner was leftovers from my lunch the day before: a piece of toasted sourdough bread, my tofu chicken salad, and another peach. I usually like to eat at least one serving of greens for dinner, but wasn’t able to get that in today. But that’s okay! Even as a nutritionist, my diet isn’t perfect. I don’t beat myself up for the food choices I make. Sometimes I crave a good veggie burger with crispy fries, and sometimes I eat a giant salad. It’s what you do the majority of the time that matters most.